Aside from all things chocolate, another dessert I often crave is a lemon tart. There is something great about the balance of tart and sweet, the crispness of the crust versus the creaminess of the filling. I hope you had a wonderful Thanksgiving and don't mind jumping right back into talking about food and desserts! 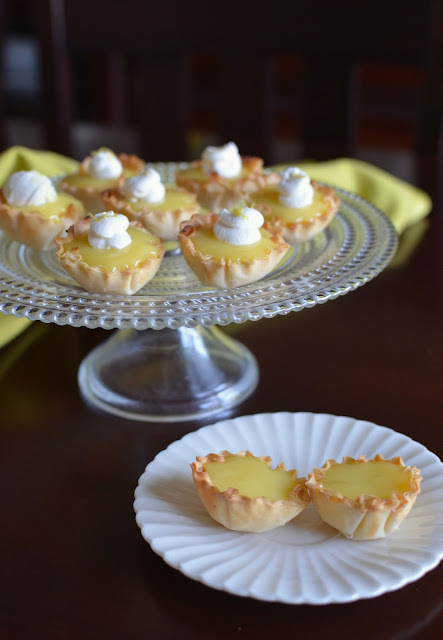 Continuing the theme of mini desserts and small bites, and to satisfy my all-too-frequent craving, I recently made a small batch of these easy mini lemon tarts using prepared phyllo cups. It's a simpler, faster - not to mention, lighter - way to satisfy that lemon tart craving. And it's the holiday season when party foods, small bites, and variety is the name of the game. A mini dessert like this brightens up the table and taste-wise, it's light and fresh, packed with a strong lemon punch that provides so much flavor in each small bite. These mini phyllo cups from the supermarket are very handy. I usually use them for savory fillings (I'm thinking of a spin on crab cakes at my Christmas party this year) but they're naturally great for many kinds of sweet filling, including lemon curd. I was inspired to make these after watching a cooking show. From it, I picked up the tip of lightly spraying the phyllo shells with cooking spray and sprinkling them with some granulated sugar before baking for them for a few minutes to help make and keep the shells really crunchy. I made a small batch of lemon curd for the filling and topped the little tartlets with a little bit of whipped cream, to which I added some fresh lemon zest. You can leave out the whipped cream if you like but I think they make them look extra special. These phyllo cups are so incredibly crispy, shattering in your mouth, and cushioning all that lovely tart yet sweet flavor of the lemon curd. It's easy to eat many of these! I can't help but think I'd love to make some chocolate mousse tartlets and set them alternating with these lemon ones on a big platter for a holiday party. Don't you love all the food and variety we conjure up during the holiday season? Here's to many, many tasty small bites and lots and lots of celebrations to go with it in the month ahead! To start, pick yourself up a packet of mini phyllo cups. I generally find the Athens brand that comes in a pack of 15. For my small-scale recipe, I made half a batch of lemon curd and this should be just about enough to fill the 15 little cups. These mini phyllo cups are literally just 15 calories a piece. It's a great option for holiday bites when we're faced with so many options and need to make space for a ton of food! Now the best thing about baked phyllo is that incredible crispness! As I mentioned, I was watching a cooking show and learned a simple trick of upping that crispiness. I normally bake the cups for 5 minutes or so to crisp them up before filling but this time, I sprayed them with a little cooking spray and sprinkled some granulated sugar over them before baking. I didn't use nearly as much sugar as the recipe suggests but I do think the sugar adds texture and almost provides a little barrier between the wet filling and the crispy shell to insulate them and keep them crispier, longer. I made my lemon curd the day before and kept it chilling in the fridge. To assemble, bake the phyllo cups, let cool and then fill. 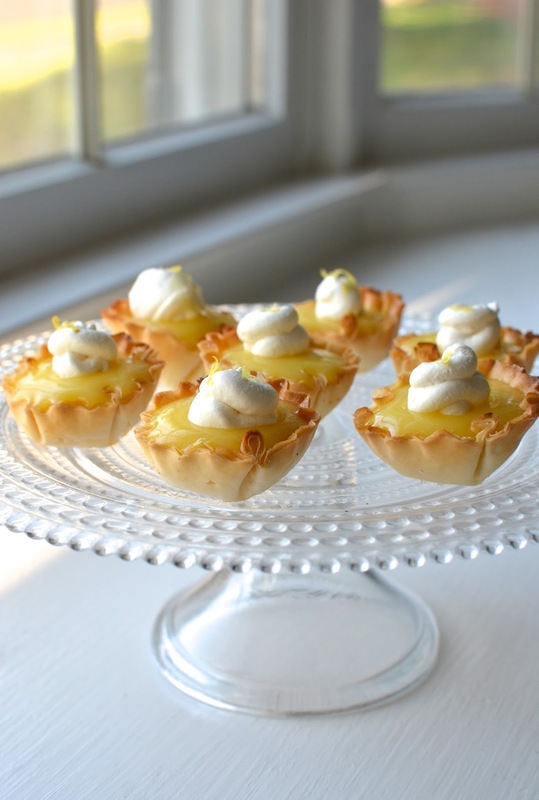 Adding a touch of whipped cream, beaten with fresh lemon zest, completes them. For best results, make these the day you plan to serve them. You can assemble the tartlets a few hours in advance and store the them in the refrigerator (I just left them uncovered). They hold up and still taste good the next day but the phyllo cups will naturally lose most of its crispness. Since lemon curd can be stored in the refrigerator for a few days and the phyllo cups only take minutes to warm up, you could even bake as few or as many as you like "a la minute". I think lemony desserts are enjoyable any time of year. I hope you agree! For the lemon curd, place sugar into a small, non-reactive saucepan. Zest lemon directly over the sugar. Using your fingertips, rub the lemon into the sugar until it feels slightly moistened. Add lemon juice, salt, and butter. Heat the mixture over a low flame. Whisk the egg and egg yolk together in a small bowl and set it nearby. When the butter is melted, temper the eggs by whisking in some of the warm lemon mixture into it. Scrape the warmed eggs back into the saucepan and cook over low heat, whisking constantly, until the mixture thickens to a consistency like soft jelly. Pour the lemon curd through a strainer into a bowl. Place a piece of plastic wrap, pressing it directly on top of the curd, and chill in the refrigerator until ready to use. Place phyllo tart shells on a small baking sheet. Spray with cooking spray and sprinkle over with granulated sugar. Bake for 5-10 minutes, until golden brown (keep an eye on it to avoid over-browning or burning). Set aside to cool completely. Assemble by distributing the lemon curd among the mini tart shells. If desired, top with a dollop of freshly whipped cream (I whipped about 1/4 cup of heavy cream with a sprinkle of sugar, a drizzle of vanilla extract, and zest of half a lemon) and garnish with additional lemon zest. Set on a platter and serve. If not serving immediately, you can place the assembled tarts in the refrigerator for a few hours until needed (I leave them uncovered). They are best eaten the day they're made since the phyllo cups will lose its crispness. Hi Monica, here in the southwest my grapefruit and lemon trees are just about bursting, these look wonderful. Love this time of year! That sounds amazing, Cheri! Enjoy it. Thanks so much, Tricia! Thanksgiving was really nice...relaxing, with great food, and most importantly, surrounded by family and just enjoying life. I should've made those rolls for Thanksgiving (would've looked like a rock star : ) but I'm glad we tried them tonight with our "leftover" turkey noodle soup. Thanks again! Your tarts are adorable! I'm a big lemon fan too, and I'd welcome these for dessert. Thanks, Beth. Hope you had a great Thanksgiving. Your lemon curd looks so smooth and great! I love those adorable tarts, Monica. The sieve definitely comes to the rescue when making lemon curd. : ) Thank you, Angie. Yummy! Little and cute treats! They are just cute to look at and so easy to eat. I don't remember that about your wedding cake but what an adventurous flavor. : ) I love it! I'm glad this no-nut idea works for you, Wendy. I do love lemon curd and since the flavor is strong, I find a little satisfies my craving very well (for the moment, at least). I only made 9 first go-round and kept the rest of the curd in the fridge and baked another batch 2 days later. The sugar trick is interesting. I think if you are going to bake/eat them right away, it isn't totally necessary (just bake the cups w/o the sugar). If they need to hang out for a few hours, I think it's adding the sugar is a good trick. And since you're not having a sweet crust here and the curd is so tangy, that little extra sugar doesn't hurt. Okay, these are SO cute!! I would love these for dessert! Itty bitty bites are definitely cute...thanks, Cathleen. I could just devour every one of these --- the tang of lemony desserts is my weakness --- and I love the little shells! Phyllo tarts like an amazing idea, Monica. Lemon desserts and so refreshing and delish. I bet they must have tasted divine. I exactly know what you mean, these phyllo cups are so handy and so fancy for mini desserts. Absolutely love what you've done here. The creamy lemon custard must be like heaven in those crispy shells, so good. So glad for phyllo pastry. Hope you enjoyed your thanksgiving my friend. We had a quite one, relaxed and watched a lot of movies and played games. Always a nice time of the year. It's citrus after chocolate for me too. What a lovely idea Monica! Guilt free and mini sized so one needs a big plate of these. And very pretty too! I use phyllo pastry to make pot pie tops because it looks quite nice when it crisps up. I have to try tarts with them. Thanks, Sonali. I love using phyllo in place of puff pastry where it makes sense. That pot pie sounds perfect. Simple & delicious, what a gem! (: I love the idea of presenting an alternative lemon & chocolate dessert dish; it would look beautiful. The recipe for lemon curd calls for lemon juice...I would use fresh if that's what you're asking.